So, growing up I never enjoyed eating fish. The only seafood I would actually eat was shrimp but now I enjoy scallops, salmon, and TILAPIA! Tilapia is actually one of my favorites because it is what my mom’s choice of fish to cook for us for dinner. Now, I do the same for my husband and I. 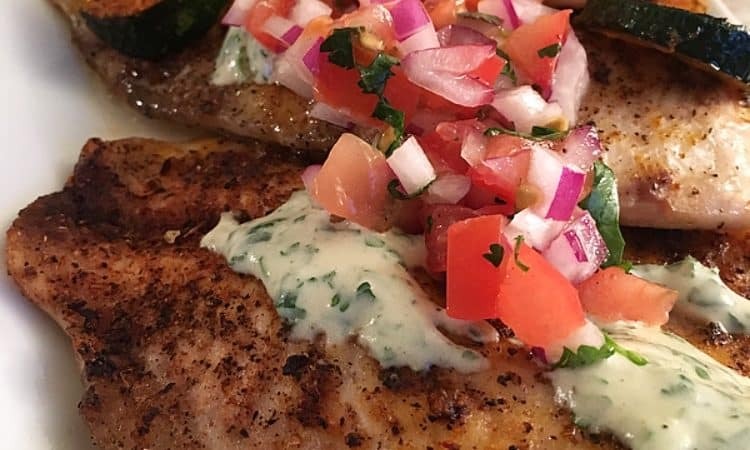 🙂 This oven baked spiced tilapia with cilantro tahini sauce & tomato salsa is literally the ultimate dish. It is a tad spicy yet refreshing but also creamy from the sauce. I am positive you all will love it! 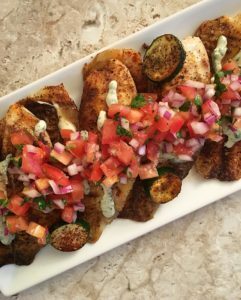 In a sprayed baking pan, place the tilapia in the pan. Combine everything else in a small bowl and mix together. Pour that mixture slowly over the tilapia making sure to coat the tilapia more than the pan itself. Bake in the preheated oven for about 25 minutes. I also sliced a zucchini and baked it with the fish as well just to get more veggies in to my dish. That is totally optional though. Squeeze some fresh lemon on top while fish is still warm and Enjoy! Place all the vegetable ingredients in a bowl and then add the olive oil, salt & pepper, sumac and lemon juice. Then mix all together. Place all this in a Food processor and mix till smooth.